UPDATE: Crash claims the lives of truck drivers from Sheridan and Winlock, Wash. State police blamed icy roads for the collision. 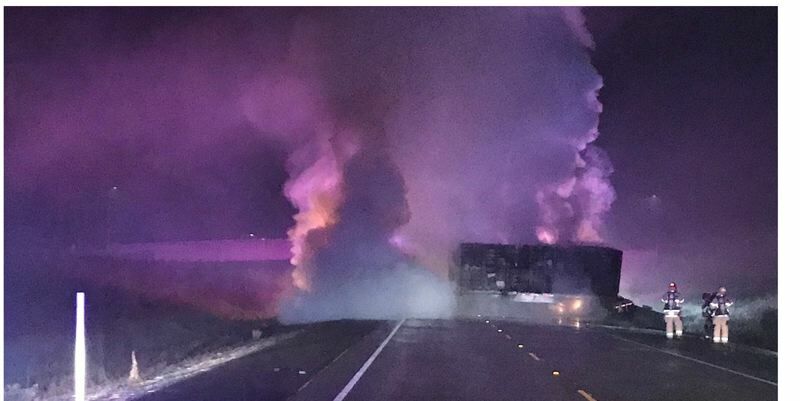 Two drivers of commercial trucks died early Monday morning in a fiery crash that closed the Newberg-Dundee Bypass for several hours. Oregon State Police reported that the crash happened at about 5:20 a.m. Jan. 7, at milepost 57 of the bypass, which connects Highway 219 with Highway 99W east of Newberg. The drivers both died in the crash. Icy conditions were blamed for the collision. State Police identified the victims as 52-year-old Andres Resendez of Sheridan and 45-year-old Daniel Green of Winlock, Wash. Troopers said Resendez was driving a 2006 Freightliner pulling two empty tanker trailers east when it collided with a westbound 2012 Freightliner driven by Green, that was pulling two trailers loaded with empty poultry cages. A 2000 Hyundai, driven by 23-year-old Delia Lake of McMinnville, collided with the back of one of the tankers. Lake was treated at a local hospital for what state troopers said were minor injuries. The bypass re-opened at about 4 p.m. Firefighters from four departments battled the blaze that erupted after the collision. Firefighters reported that flames from the two trucks were 50 feet high. Because there were no fire hydrants nearby, firefighters from Dundee Fire District, Tualatin Valley Fire & Rescue, Dayton Fire District and St. Paul shuttled water to the scene. It took more than an hour to control the blaze. Fire crews fought to control the blaze for more than an hour. By mid-morning state crews were washing fuel off the highway. State police blamed the crash on icy roads that also forced school districts in Washington, Columbia and Yamhill counties to open two hours late, or, in some cases, close for the day. Oregon's Department of Transportation reported early Monday morning that black ice and other icy conditions were making driving hazardous in some parts of Northwest Oregon. The National Weather Service issued a winter weather advisory for the region until about 9 a.m. Monday.